Blondie and Brownie: Peanut Butter All-Stars! I paid my very first visit to PB & Co when I was on the college hunt. Peanut Butter & Company and the unfortunately now long gone, Cookies & Couscous, were my first taste of Greenwich village cool and I was hooked. When I decided to attend NYU, I had regular PB & Co dates with my cousin, Kate and then with Lawman. But my affinity for peanut butter sandwiches goes back even further than that. In fact the very first thing I ever "cooked" was a peanut butter sandwich. I was three years old at the time. My mom had gone to visit an elderly neighbor. My dad was busy working on something. He promised to make me dinner soon. But soon was not soon enough. So using the kitchen drawer handles as a ladder I crawled up onto the counter, retrieved my special plastic purple plate and then grabbed two slices of bread and the jar of crunchy peanut butter. It was probably the most satisfying sandwich I ever made, because I knew if I could make a peanut butter sandwich myself I could make anything. 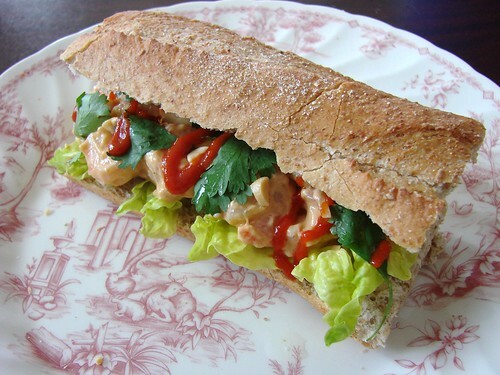 Peanut butter sandwiches have never been far from my heart, so it's fitting that my first recipe for the blog is a Spicy Thai Peanut Shrimp Salad Sandwich. Head on over to check it out and while you're there browse check out recipes by fellow bloggers, including the very awesome Jessie Oleson from Cakespy and Marc Matsumoto from No Recipes. Enjoy! Great combo! I love shrimp salad and Thai twist you did on this one sounds great:-) Thanks for the link! Thanks, Marc! Enjoyed your recipe as well. Can't wait to see your other 4!